This is what my former roommate had to endure as I played The Legend of Zelda – Ocarina of Time in my sophomore year dorm room. Anyone who has played that game and wanted to get from Kokiri Forest to Hyrule Castle by rolling should be familiar with it. I love drawing parallels between video games and real life. Legend of Zelda is one of my favorite series. The Triforce fits very well here because my fitness regimen consists of three components. I call it my Fitness Triforce. The triangle is a very strong geometric shape – this is why the truss is such a strong component of structures like the Golden Gate Bridge. Throughout my blog, I will mention each of these components periodically. Traditionally, when we think of strength, we think of bulky, muscular men bench pressing. Lifting really is a great way to increase your strength. The amount you can lift is what this component is focused on. This corresponds to the Triforce of Power. Careful, for the triforce does not distinguish good from evil! Use your power wisely! Endurance is related to how efficiently your body can perform under stress. This part is two-fold. First, you can increase your lung capacity, which means you can store more oxygen and nutrients to distribute to your organs and muscles. Second your heart is a muscle which is strengthened through cardio. For other muscles, endurance can be manifested by exercises such as: how long you can hold your plank and how many reps (repetitions) of an exercise you can perform. This corresponds to the Triforce of Courage – the courage to push your body to its limits (hello high intensity interval training) and trusting your body’s ability to adapt. Now, if you’re naturally flexible, consider yourself lucky – you probably won’t have to work as hard here. But if you’re like me or most people and suffer from tight muscles, a good stretching regimen (read: yoga) can benefit you. This corresponds to the Triforce of Wisdom, as I find flexibility training to also be mental exercise. Finally, I want to say a few words on diet which I put in the unifying center of the Triforce. Personally I don’t find much value in figuring out when to eat, how often to eat, specialty diets, detox – much of it is not even supported by robust research. What we do know is for weight loss, you must consume fewer calories than you use. I will talk more about this later, but diet is absolutely key in getting results. Some people exercise for hours and will not lose weight because they keep eating a lot. There’s no magic formula here and there’s no way to cheat. Eating should not be anything terribly complex; your body should signal to you when and how much to eat. More on this later. 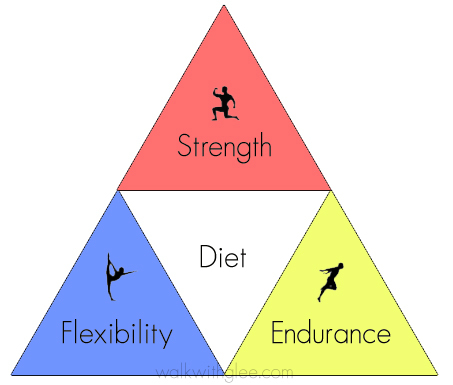 I created this Fitness Triforce to show you that there are multiple ways to train your body. Many exercises can even combine multiple components. Don’t feel cardio today? Do some strength training instead. You can build and sculpt your body every day but you don’t have to do the same old thing every day – and you shouldn’t, because your body will adapt to it and you’ll plateau quickly. Plus, it also helps you figure out what you’re focusing on. This is why I strongly advocate P90X as a way for people to get started with a fitness routine. I will review this program in a future post. If you think I’ve missed anything or have any further things to add, feel free to add them in the comments!